The Plastimo Iris 50 is a hockey puck style hand bearing compass with good reviews from our customers. A hand bearing compass is used to measure the magnetic direction of sighted objects relative to the user. Two key questions you ask yourself while on the water usually concern your heading and your position. A steering compass tells you where you are going but its smaller sibling, the hand bearing compass, holds the answer to where you are. Unlike a GPS receiver that does the same–perhaps quicker, more conveniently and more precisely–the hand bearing compass does not rely on electrical power or satellite reception. It is a good backup and a formidable instrument for racing sailors to see who is sailing faster on the same tack or gybe. A hand bearing compass allows you to take bearings of distant objects, which you can then transfer to a paper chart to create plot lines. Taking bearings of at least two objects that are 45 or more degrees apart results in intersecting lines on the chart, giving a position fix. To improve accuracy, we recommend taking bearings of three different objects and several sightings of each one and taking an average of the readings. We offer several different hand bearing compasses, either in "hockey puck style" or with pistol grips. High-end binoculars also come with bearing compasses, and many boaters prefer a good set of binoculars over a hand bearing compass, because they're easy to use. To use an arm's-length compass (usually with a pistol grip), put the lanyard around your neck to stabilize the unit. Hold the compass at eye level, then line up the V-notches in the sighting vanes on the top of the compass with the desired object; now check the bearing on the compass card. If this sounds like juggling while walking across the street, you feel the same way we do. It can be tough to keep compass and sights lined up and checking some small numbers all at the same time. 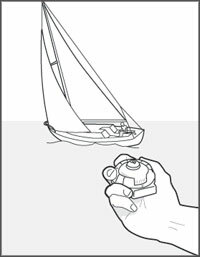 Add to that the motion of a boat in a seaway and poor visibility and you face long odds of taking an accurate bearing. A better choice is a hockey puck style compass with an infinity prism that is held up to your cheek, and lets you sight across the top of a small prism. When you are focusing on the object in the distance, the prism projects the bearing into your field of vision so you don't have to shift your eyes. Object and bearing are in focus at the same time, which is a tremendous asset for taking accurate bearings in rough conditions. Operating a digital compass is very much like taking a snapshot. You use the unit's aiming system to take the sight, then press a button. The compass stores the bearing in electronic memory for future recall. Take a bearing upon first sighting another approaching vessel, like a ship. Take a second bearing a few minutes later and repeat at regular intervals. 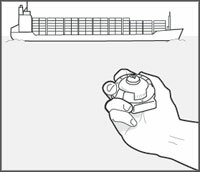 If the approaching ship's bearing remains the same, you are at risk of a collision. It their bearing has changed, rotate so you are sighting along the original bearing. If you're now looking at the water in front of the ship, you'll pass ahead of it. Sighting behind the vessel means it will pass ahead of you. Compactness: We really like the models that are comfortable to wear around your neck on a lanyard and fit easily in a pocket, so you can keep them nearby. 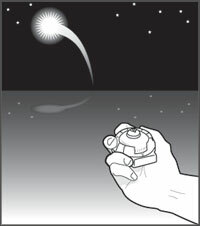 Night Lighting: Like other navigation instruments, bearing compasses should have night-lights. Some use small battery-powered lamps. Others have glow-in-the-dark lighting which uses small quantities of photosensitive or radioactive gas. We like this type best because it is ready at a moment's notice, and never needs charging or new batteries. Accuracy: A precisely graduated card and excellent damping are critical for obtaining accurate sights. 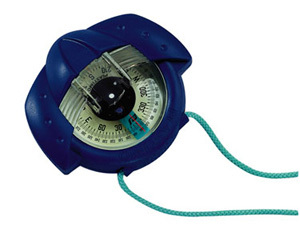 On a moving boat, most people can get a bearing accurate to 2-3 degrees using a well-damped, infinity prism compass that is held near the cheek. In a seaway, pistol grip compasses that are held at arm's-length are probably accurate to about 10 degrees. Sources of error that affect the quality of your bearing include inaccurate aiming, violent motion, steel-rimmed glasses and bad visibility.